Worried parents stand over the crib, listening to their baby cough and struggle to breathe. He may have bronchiolitis. Most parents have heard of pneumonia or bronchitis, but what does bronchiolitis mean? Bronchitis is inflammation of the large airways in the chest and pneumonia is inflammation of the lung tissue. Bronchiolitis is inflammation of the smaller airways connecting the two. It is usually a viral infection. RSV is responsible for the illness in many children. Adenovirus, parainfluenza (croup), and other viruses can also cause it. In adults and older children, RSV usually appears as a bad cold. However, in babies and toddlers whose bronchioles are smaller and easier to plug, these viruses often cause bronchiolitis when inhaled. It is primarily a disease of young children before their second birthdays. The most common age is about 6 months. Winter and early spring are bronchiolitis season. Children in day care are usually much more likely to get bronchiolitis. Kids who are exposed to cigarette smoke are at even higher risk. Babies who attend day care are less likely to get bronchiolitis than those who stay home with a parent who smokes. Boys are more often affected, as are formula-fed infants. Those at high risk for asthma also appear to be prone to bronchiolitis. Most kids who get bronchiolitis have been exposed to an adult or another child with a cold in the previous week. Bronchiolitis usually begins with cold symptoms such as a runny nose, sneezing, and perhaps a mild cough. The appetite is often decreased. The child may have a fever or might be a bit cooler than normal. After a day or two, breathing becomes faster and the cough becomes more severe. It may be a deep or wheezy cough. The child may develop wheezing and respiratory distress. 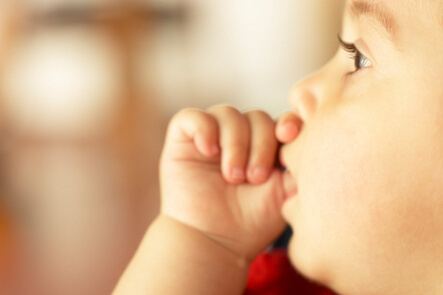 Breathing difficulties can make it hard for babies to feed. It is very contagious. It spreads most commonly by contact transmission, droplet transmission, and fomites. Mild bronchiolitis may last only for a day or so. Often the disease lasts 5 to 12 days. The first 3 days are the most critical. Diagnosis is often based on the history and physical exam. A chest x-ray can give additional information, as can a pulse oximeter to measure oxygen levels. A nasal swab for RSV and other viruses might be done to identify the specific cause of bronchiolitis. There are no specific medicines for home treatment. It is important to give plenty of fluids to prevent dehydration. Also, a humidifier or saline nose drops might be recommended to thin the mucus. Some children need supplemental oxygen or even mechanical help to breathe. A powerful aerosol treatment specifically against RSV is sometimes used for hospitalized children. Steroids and antibiotics are not usually helpful. It is unclear whether inhaled medications such as albuterol are helpful. If possible, protect your baby from exposure to sick individuals during the peak bronchiolitis season. In addition, good hand washing, particularly just before anyone handles susceptible infants, can decrease spread. Don’t forget to use a tissue when you cough or sneeze. Two products are now available to prevent RSV infection in children at high risk for serious disease. RSV-IGIV (RespiGam) and palivizumab (Synagis) have been approved for high-risk children (such as premature babies and infants with severe heart or lung diseases).